A Bury St Edmunds businesswoman has been named the ‘New Bridalwear Retailer of the Year 2017’ at the British Bridal Buyer Awards, the industry’s Oscars. Harriet Moore, who runs House of Snow in Hatter Street, said she was completely amazed and delighted when she was revealed as the winner at a glittering awards dinner in Harrogate. 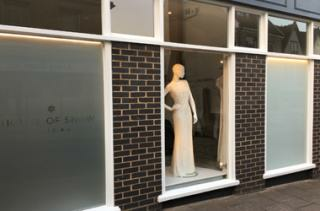 The judges said they were ‘blown away’ when reading about Harriet’s inspiration to become a bridal retailer and were impressed with how much the business had grown in such a short time. They noted that by ‘quickly working out and delivering what her brides really want, Harriet has found a simple recipe to sales success’. Harriet, 28, named the luxury bridal boutique House of Snow after her grandparents Betty and Dennis Snow, who were married for 62 years, which Harriet feels has to be a good omen to all her brides. House of Snow sells stylish wedding dresses from top designers such as Jenny Packham, Suzanne Neville and Pronovias, as well as a range of unique, handpicked accessories to complete the bridal look. “As well as selling gorgeous dresses, we pride ourselves on giving the best customer experience that any bride-to-be could wish to have. It’s a very special moment when you try on your wedding dress for the first time and you really do know when you have found the right one for the big day. Harriet, who has a first class honours degree in costume design, previously worked as a dresser on TV programmes like Dancing on Ice. She worked for a time in the USA making bridal gowns before returning to the UK and working in a wedding shop. Starting House of Snow was her dream come true and Harriet now plays an active role in the local Bury St Edmunds business community and is a member of local Business Improvement District (BID). You can read Harriet’s 5-star reviews on Facebook or visit the website here.